I watch birds pretty much all the time. This may come as a surprise to folks who keep their birding casual, or who limit their watching to a backyard feeder. It will probably be all too familiar to peeps who arise before a cold dawn so they can trudge through some muddy marsh, or who spend well earned bucks to do similar comfort challenging behavior in lands very far from home. I watch birds all the time and I can’t help it. It doesn’t mean that I never leave home without packing binos, or that I arrive at an outdoor wedding wearing a wide-brimmed hat, many-pocketed clothing, and hiking shoes. Nor do I start a conversation at parties with the words “Fulvous-breasted Antpitta” although the world would be more interesting if we all did that… It’s more like always being aware of your natural surroundings and keeping an eye and ear out for whatever birds are in the vicinity. We can tell party goers that the name of the Fulvous-breasted Antpitta has been changed to the more mundane “Thicket Antpitta”. It’s more like clandestine or covert birdwatching, constant spies of all things avian although certain circumstances can reveal our true intentions. That usually happens when we are confronted with the unusual. Like if a chickadee calls while a family member is making his or her wedding vows, the covert birder won’t even blink. Have a technicolor Lewis’s Woodpecker fly over a funeral in Wisconsin, though, and the birders are revealed when they either let out an audible gasp, tear their phones out of their pockets with fumbling hands to get the word out, or suddenly rush back to their vehicles (to either report the news or fly home for optics). The revealing can also happen in a theater, mall, or other unexpected places. On one memorable occasion, I recall a birder breaking his cover while I was watching the movie, “The Thin Red Line”. Given that the director of that war film is into nature and might also be a birder, I guess it was expected that a few fantastic looking birds from the Solomon Islands would appear on the screen now and then. One such feathered feature was a frogmouth and sure enough, when the footage of said bizarre bird showed, the quiet dark of the theater was interrupted by a quiet exclamation that perfectly echoed my train of thought, “That’s a frogmouth!” I didn’t know what the other people in the audience thought about that proclamation of truth but I knew right away that a fellow covert birder was present. I never saw who my fellow birder was but it did make me realize that there are more of us constant covert birders out there than I had realized. 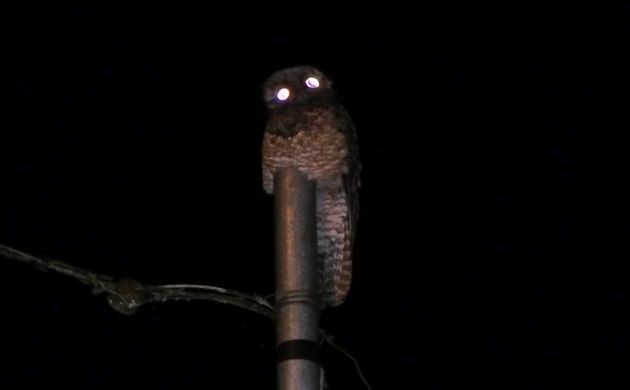 In Costa Rica, instead of frogmouths, we have equally weird and wonderful potoos. 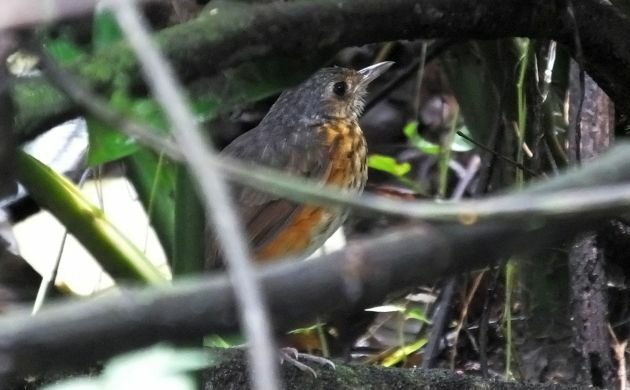 I never stop birding no matter where I am, Costa Rica included. These days, my covert birding has a particular bent to it, one that takes into account the avian movements happening at this special time of year. With fall migration just kicking into gear, there are interesting birds around and I hope to see a choice few each and every time I bring my daughter to and from school. The Yellow Warblers are easy enough, I hear a few chip here and there as I drive through neighborhoods and pass by vegetated riparian zones. The common wood-warbler of wet willow thickets in the north is always nice to hear and see but it’s not really what I am looking for. I visually scan the trees, bushes, and coffee farms for other, much less common quarry, notably calling Empids, their longer-winged pewee relatives, Orchard Orioles, and, most of all, cuckoos. 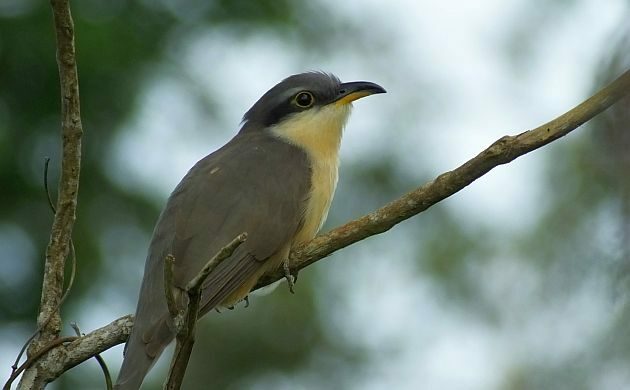 Both Black-billed and Yellow-billed Cuckoos pass through Costa Rica on their way to and from the Amazon but if you thought those caterpillar gourmands were tough to see up north, try finding them when they are mute and sneaking their way south. Once they leave the breeding grounds, those long-winged elegant cuckoos become veritable black ops birds of the first order. Based on the paucity of observations, it’s clear that part of their caterpillar finding mission also includes a promise to keep out of sight, to maintain the way of the cuckoo on a serious down-low (or perhaps that is the true way of the cuckoo?). 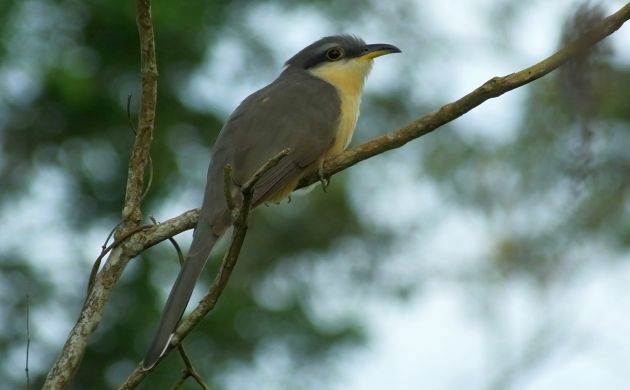 In Costa Rica, at least the Mangrove Cuckoo is way less ninja than the Black-billed. This one is photo friendly at several sites. Dates of past glimpses of cuckoos on a winter migration mission guarantee that several of both species are somewhere in Costa Rica right now (!). However, likewise based on past observations, I can also guarantee that you will never see them unless you blend focused watching with a good dose of luck. The only Black-billeds I have seen around here were singles being chased by grackles in urban situations, no doubt because their covers were blown. Since I can’t afford to spend the time scouring the countryside in search of migrant ninja cuckoos (I would if I could! ), I spy-watch for them while driving to and from my daughter’s school. In keeping with my own year bird mission, I purposely take routes that pass through green space (mostly coffee farms), look for surreptitious cuckoo shapes in fig and Inga trees, and stare at more doves in flight than a hungry house cat. I also listen to the night sky, hoping to hear them call as they migrate overhead although I am beginning to suspect that radio silence on their part is part of the plan. Most of all, though, I keep watching green space, hoping for a flyby cuckoo from the car or while walking near the house. It can happen anytime, last year my sole Yellow-billed was a backyard surprise, this year, I will take both any way I can get them! I gotta keep birding, I can’ help it. OMG that so describes me! Even my wife, after reading this said the same thing. If I was to mention every bird spotted, while driving, walking at a store, park etc, the people around me would have me lined up for a padded room! Good to know I have company out there! Cuckoos are ninjas. It is known. Haha, I’m all for that covert signal.